Sour Heart is a collection of seven linked short stories narrated by young Chinese-American girls living in New York City in the 90s. It’s exceptionally hard to describe what I’ve written without sounding delusional or boring, so I’ll just say they are stories about growing up, and the pleasures and agonies of having a family, a body, and a home. The Secret Garden by Frances Hodgson Burnett, because the protagonist is described in the beginning as a “sour” and “disagreeable” girl; the Wayside School series by Louis Sachar, because they are so weird and experimental; and all the Sweet Valley and Baby-Sitters Club books because it was comforting to sink into those totally far-fetched tropes of girlhood…I loved it. When I was a kid, and would bombard my grandfather with made-up stories about sliding down the trunks of elephants at the zoo on the bike ride home from preschool. And then again when I immigrated to New York and my ESL teacher had us write a one-sentence story and I went on for two pages. Then there was a brief time in elementary school when I thought I wanted to be a fashion designer, and wrote a poem about it that won first place in the Career Day Poetry contest, and immediately decided I would be a poet instead. I suppose I was a hog for attention and validation from the beginning. A sagging pink couch with lots and lots of papers flung everywhere and piles of books open to the wrong page. What comes out of my body; but actually, I think most people care about that just as much, but prefer not to talk about it so explicitly and regularly. I forget the meanings of words all the time and use them incorrectly. Like recently I said, “Thank you for vilifying me!” when I meant “vindicating." Whoops. People should read Janet Mock! Start with her memoir Redefining Realness, which is a beautiful, touching, funny memoir about growing up as a multiracial trans girl in Hawaii. Then read her new memoir about getting through her twenties, Surpassing Certainty. I’m on a memoir kick right now because I also tore through Roxane Gay’s Hunger and was utterly transformed by it (I know, it’s like join the club!). Myriam Gurba has a memoir coming out in November, Mean, from the great Emily Books imprint at Coffee House Press, and I loved it — the brazenness, the irreverence, the tenderness. It’s full of attitude, and takes childhood seriously instead of seedily idealizing it through some kind of corny nostalgia for the past. I’m tortured by all of my material belongings, with the exception of books I truly love. What if it’s too interesting to reveal? I really wanted to go to Scotland because of the novels of Alasdair Gray, my favorite Scottish writer and weirdo, but I only made it to Edinburgh and a true devotee would have gone to Glasgow. Title: She Didn’t Really Like You. Subtitle: And She Felt Really Bad About That. The first line of Frank O’Hara’s poem, “Ode to Joy” is perfect: “We shall have everything we want and there'll be no more dying." I also like very much when he writes in his manifesto, “Personism,” that this movement he founded “puts the poem squarely between the poet and the person, Lucky Pierre style, and the poem is correspondingly gratified. The poem is at last between two persons instead of two pages.” I make all my students read it and then look up what a “Lucky Pierre” is. My biggest grammatical pet peeve is when people grammar-police other people and use only the narrowest definition of “good grammar” to dismiss, wholesale, writing that has a few errors. Let it go! On the other hand, I really like my friend Tony Tulathimutte’s approach to grammar, because when I ask him to check my grammar, he will correct and explain the rule behind the correction, but never pedantically. And he’s not annoyingly rigid or purist about it. His book Private Citizens has impeccable grammar and is linguistically adventurous! I like watching raw vegan YouTube drama, especially the videos that are just 45-minute-long epic meltdowns. There was that raw vegan couple who advocated eating 60 bananas a day as long as you did it before 4 p.m., and later the whole thing blew apart and the dude turned out to be a steroid-abusing, sociopathic scumbag. 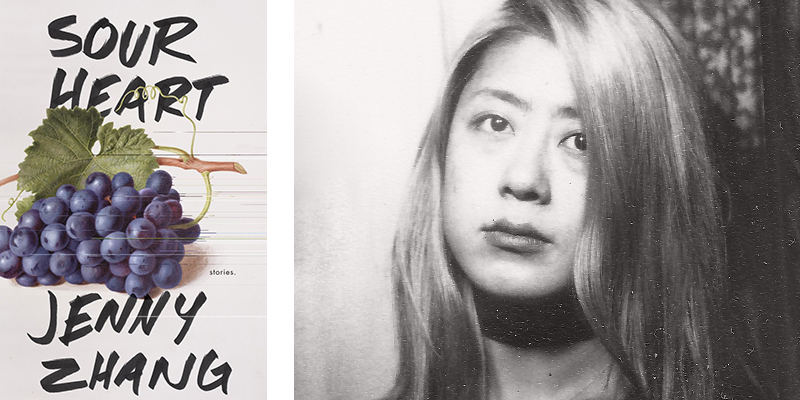 Jenny Zhang is a poet and writer living in New York City. Sour Heart is her most recent book.